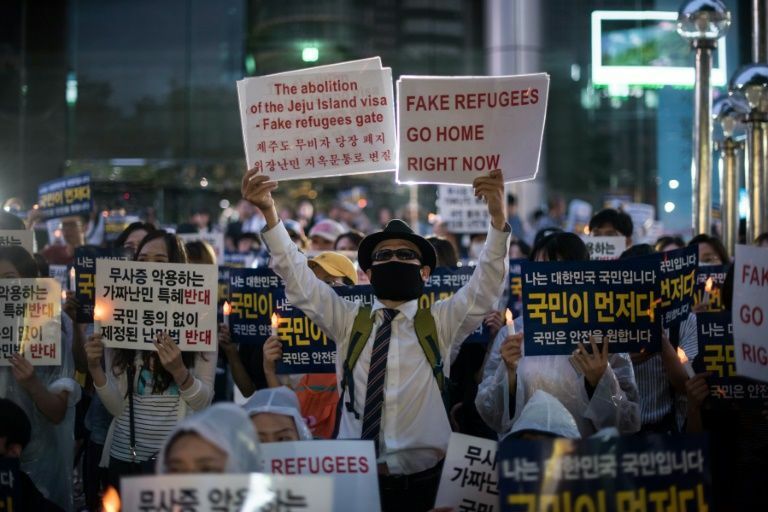 Nearly 400 Yemenis were denied refugee status by South Korea on Wednesday, months after their arrival on the resort island of Jeju triggered a populist outcry. Ethnically-homogenous South Korea grants refugee status to only a tiny fraction of those who apply, despite having been ravaged by war itself within living memory. About 500 people from the conflict-plagued Middle Eastern state arrived on Jeju earlier this year, taking advantage of the visa-free access the southern island offers to encourage tourism. Their arrivals triggered a wave of anti-immigrant sentiment in the South, where only around four percent of the population are foreigners, mostly from China and Southeast Asia, and discrimination against migrant workers is widespread. Many opponents cited the Yemenis’ Muslim religion and nearly 700,000 peoplea recordsigned a petition on the presidential website urging tightening of what are already some of the world’s toughest refugee laws. The Jeju visa exemption rules were rapidly changed to exclude Yemenis. A total of 481 Yemenis formally applied for asylum. Of those, 34 were rejected outright on Wednesday, the justice ministry said, and 339 were given humanitarian stay permits, allowing them to remain in the country for a year. Those whose claims were rejected outright may appeal. Decisions were deferred on 85 others. Last month an initial 23, mostly families with children or pregnant women, were given the stay permits, which need to be renewed every 12 months and can be refused if the security situation in Yemen is deemed to have improved. None of the applications for refugee status have so far been successful. Since 1994 South Korea has approved just 4.1 percent of applications, official figures show. The rules do not apply to North Koreans, who are automatically considered citizens of the South. A recent opinion poll showed about half of South Koreans opposed accepting the Yemeni asylum-seekers, with 39 percent in favour and 12 percent undecided.